This week I finally found the time to hook up the Dongbu Robot Herkulex DRS-0101 servo that I picked up last month at the VStone Robot Shop in Tokyo. (If you’re here in the States, you can pick these up from Road Narrows.) After a few missteps, and some fantastic tech support from Dongbu Robot, I got it working. It really isn’t difficult; here’s how to do it, and a few tips I learned in the process. Just imagine the rotational, torquey goodness contained in this cute little box. Inside is the servo itself, a bag of parts, and a connector cable (not shown). The parts bag contains 16 screws, 8 brackets of various sorts, 2 cable guides, and an idler horn bushing and washer. Also in the box, but not pictured above, is a 200 mm connector cable. Before going any further, you should find a copy of the manual. The best place to download this is via hovis.co.kr (here’s a direct link to the PDF), but you can also find it at places like Tribotix and via eBookBrowse. This is a surprisingly well-written manual (with just a couple of omissions that I’ll cover later). It describes everything from the parts inventory, to the dozens of ways the brackets can be used to connect two servos together, to the communications protocol. 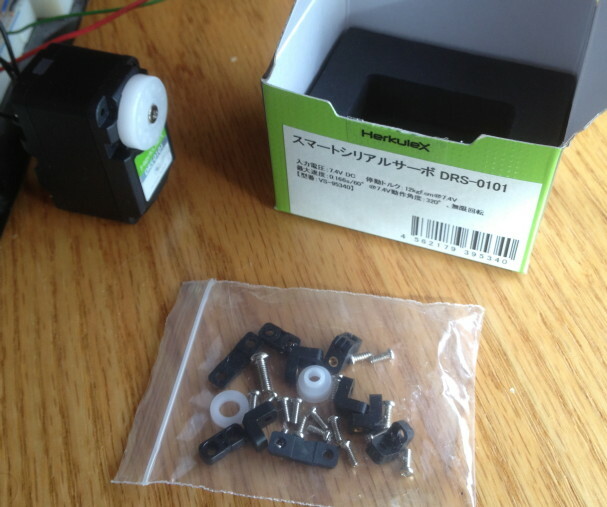 Unfortunately, the 2 mm keyed connector used by these servos is not available here in the States. I searched for a compatible connector; the guys at Dongbu searched; and I even ordered the Molex connector that looked like the closest match — but no luck. However, Dongbu does make a cable pack containing various lengths all ready to go, and Road Narrows expects to be carrying this soon. So for now, to connect your Herkulex servo to anything else, you’ll need to just hack the cable that comes with it. I simply cut mine in half, so that I can make two custom adapter cables. The first thing I wanted to connect to was a breadboard, so I simply soldered a short piece of solid-core wire to each of the four wires in the cable, and covered the ugly with heatshrink tubing. 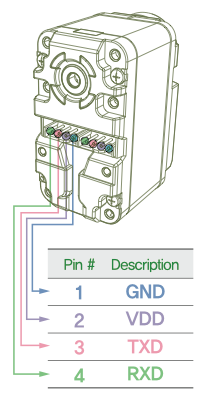 I strongly recommend plugging the connector into the servo, and matching the pin colors shown on page 17 of the manual when you do this. If you don’t have blue, purple, red, and green heatshrink, then use white and color it with a sharpie. Having the right colors on your wires will help avoid mistakes in hooking it all up. Next, you need to provide power to the servo. Note that even though the communications pins use 5V, the servo itself needs more than this; it’s rated for 7-12V, but “optimized” for 7.4V. I used a 7.5V wall wart I had lying around. Be sure to connect the ground wire for this supply to the ground for your serial board (or microcontroller or whatever else you have); all voltages need a common reference (ground) level. When you connect the 7.4V power, you should see the LED on the servo flash white once, and then go dark. This means that things look good from the servo’s point of view. If instead you see a red blinking light, then something’s wrong. Check all your connections; it almost certainly means you screwed up somewhere. Now that everything’s hooked up, you’re ready to start talking to the servo! Set your communications to 115200 bps, 8 data bits, no flow control, and 1 stop bit (the standard “8N1” serial settings), and browse sections 4-6 of the manual. The communications protocol is a simple one, where you send a short binary command packet, and get back a binary reply packet. If you’re writing your own software for this communication, be sure to send bytes (e.g. 0xFF, or 255 in decimal) rather than characters (e.g. the two letters “FF”). I did my experiments using a terminal program called “Terminus” which is not released to the public yet (but should be soon — contact me if you want to get in on the beta test). 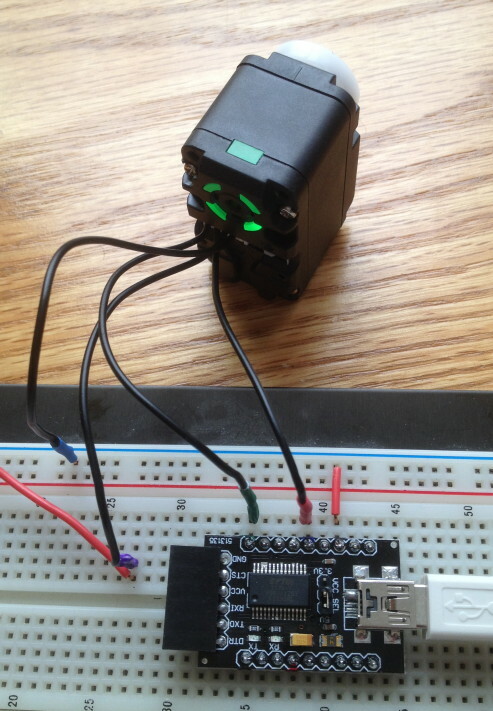 This lets me easily send binary data, and read the binary data coming back from the servo. Like all smart servos, every Herkulex servo has a unique servo ID that is stored in non-volatile memory. This is how they can all share the same servo bus, but you can address them individually. This brings us to the second (and last) omission in the manual: what is the default ID of a servo? It turns out that it’s 253 (0xFD) for a servo sold individually (servos that come with the robot kits have preassigned IDs starting at zero). This default ID matches all the examples shown in section 6 of the manual (pages 42-50), which is really great since you can try them out right away, without having to compute the checksum or otherwise think too much. So I sent exactly that, and lo and behold — the servo turned its LED on green! If you get this far, then the sky’s the limit! You’ll be able to set the ID of each servo to a unique value, and control any number of them on a bus. Make them turn continuously at any desired rate (which they will maintain regardless of load), or go to any position, over whatever amount of time you specify. Interrogate their current torque or temperature. Light up those LEDs like a Christmas tree if you like — the Herkulex servos are like minions in a box, ready to obey your every command. I did make a few mistakes in the course of reaching this point. First, I had thought (and some casual testing with a multimeter suggested) that instead of cutting the cable, I could just cram some wires into one end of the connector. But, it turns out, this doesn’t make a very reliable connection — cutting a cable, and soldering on your own connector or breadboard wire, is a much safer approach. Pin one is on the RIGHT, and pin 4 is on the LEFT. Second, I was both lazy and in a hurry the first time, and didn’t shrink-wrap the wires. (Bad hacker, no biscuit!) This meant that I couldn’t easily tell them apart, and to make it worse, I read the diagram on page 17 backwards. In the table identifying the pins (shown at right), they’re labeled from right to left, not from left to right. So, in my first attempt, I hooked the cable up exactly backwards. This meant that I was supplying 7.5V (and, in a moment of desperation, I tried 9V as well) to the serial comm pins (TXD and RXD)! To Dongbu’s great credit, the servo suffered this abuse without damage; it merely went into “alarm mode” with the blinking red light (which I now read as “hey dummy, you’re doing something stupid, please stop it”). I also ran into a problem which had nothing to do with the Herkulex, and everything to do with this DFRobot serial adapter. In my first attempt, I was using the 6-pin female connector that comes presoldered to the end of the board. But as I later discovered, the pins on this header are mislabeled, with TXD and RXD identified as RXI and TXD. I decided to give up on that header, and just solder some male header pins down the sides of the board, which works better with a breadboard anyway. In this mode, everything seems to work properly. So, if you’re using this USB serial adapter, watch out for this issue — and if the servo won’t talk to you, check whether TX and RX might be reversed. Finally, when I first ran into trouble (wondering about the voltage on the TXD and RXD pins), I submitted a support request through Dongbu’s contact form. Within a day, I received email back from Daniel Hwang, the sales manager for Dongbu’s robot line. He had consulted with his engineering staff, and gotten me exactly the answers I needed, clearly expressed in good English. Over the course of the next couple of days, I exchanged several more emails with Daniel, who was extremely patient and helpful, even though all the remaining problems I had were ultimately my own fault. In short, Dongbu’s customer support is just as outstanding as their engineering. I’m impressed. Getting the Herkulex servos up and running is, in the end, pretty darn easy. 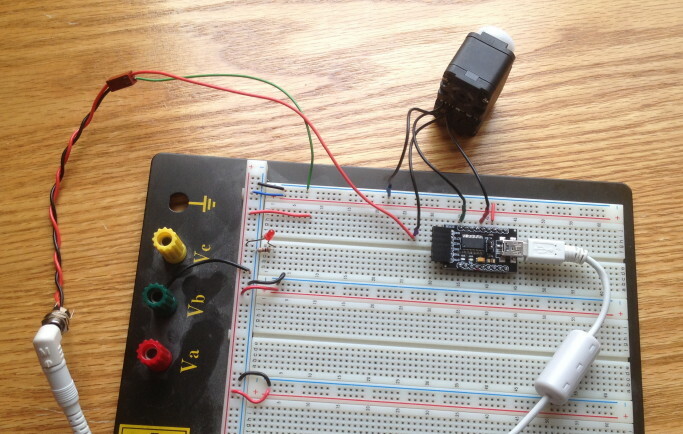 The communications protocol they speak is simple and well-documented, and should be easy to interface with any microcontroller. Both the engineering and the customer support are high quality. Moreover, the shape of these servos, and the clever bracket system, should make them easy to integrate into custom projects. I frankly couldn’t be happier with them. 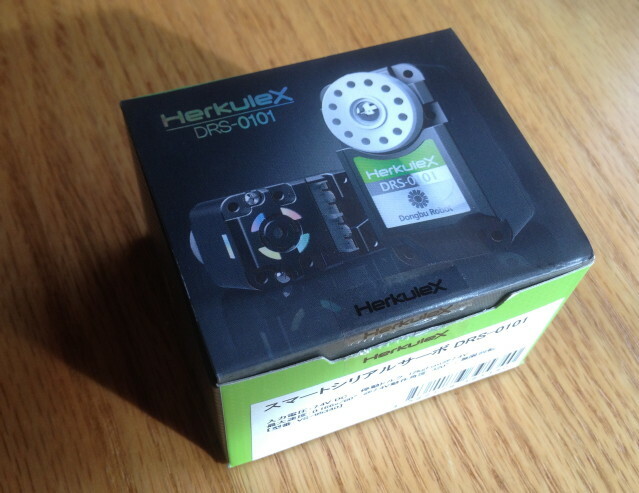 Whether you need a smart gearhead motor, or a true smart servo, I recommend you give the Herkulex servos a try. There was no PIC involved here; just a USB-Serial adapter from DFRobot (link is in the post above). Since then, I’ve also controlled these servos via a standard Arduino board (which is based on the ATmega328); I’ll write that up as soon as I get my hands on a couple more servos to make for a better demo. I don’t have much experienced with PICs, but any one with a 5V serial port ought to work fine. I didn’t use HerkuleX Manager. I didn’t use a C program either. I used the “Terminus” terminal software mentioned in the blog post, and just sent bytes directly. Any chance i could get that software from you ? It’s not quite ready yet — almost, but not quite. Keep your eye on this blog; I’ll be sure to write about it when it’s ready. Also, if you have an Arduino, watch for an upcoming post about controlling the Herkulex servos with one of those! Hi, im trying to make a node js library for manage the motors, but i have some questions about the way i have to send the hex code. But i had not sucess trying to talk with dongbu support, can you give me the email you used to talk with them?? Nice work! I have a setup here where I try to talk to my DRS-0101 directly from the computer without arduino. I’m using Dongbu’s supplied serial adapter. Right now I made a small Processing sketch w the Serial library, where I connect to the right com port and I try to write some of the commands you described above to the servo. But I don’t get a response. Any ideas? Fantastic! That’s really helpful. Thank you for sharing it! Hi, thanks for the nice tutorial. I am trying to set up a servo controlled via PC, but with no success. Like yourself I opted to skip the battery and use a dc power supply (10V in my case). The thing is, after powering up, with no other connections made, the servo flashes white once and then goes blinking red. Do you know if this is expected? Is my servo healthy or is this something to be worried about? I don’t think that’s anything to worry about — I think that’s what the servos do until they get a reset signal from the controller. This way, if the controller is dead or a connection is broken or some such, you find out about it right away!